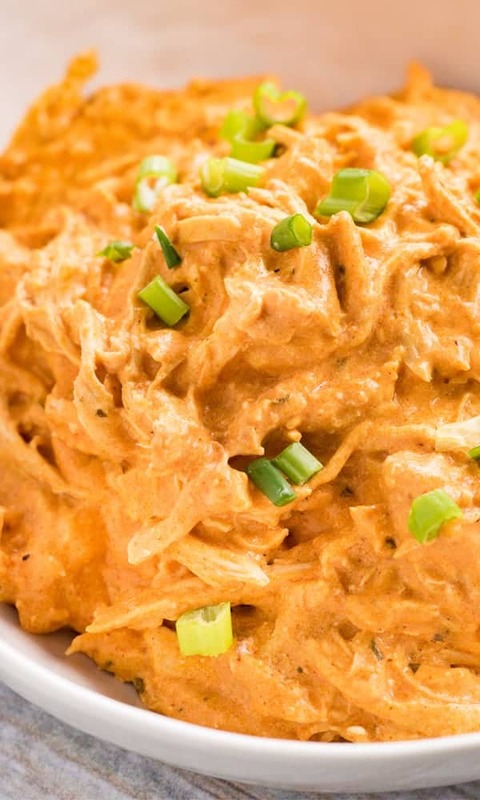 Creamy and cheesy Buffalo Chicken Dip can be made in the slow cooker or the oven! This dip tastes likes chicken wings and is a party favorite! Buffalo wings are always a hit at any kind of party, potluck, or even just for dinner sometimes! While they are so crave-able, they aren’t always practical or simple to make. That’s why I love buffalo chicken wings in dip form. It doesn’t get much easier than getting a few simple ingredients together, and letting your slow cooker do all the work to create a thick and cheesy dip that’s packed full of buffalo flavor! 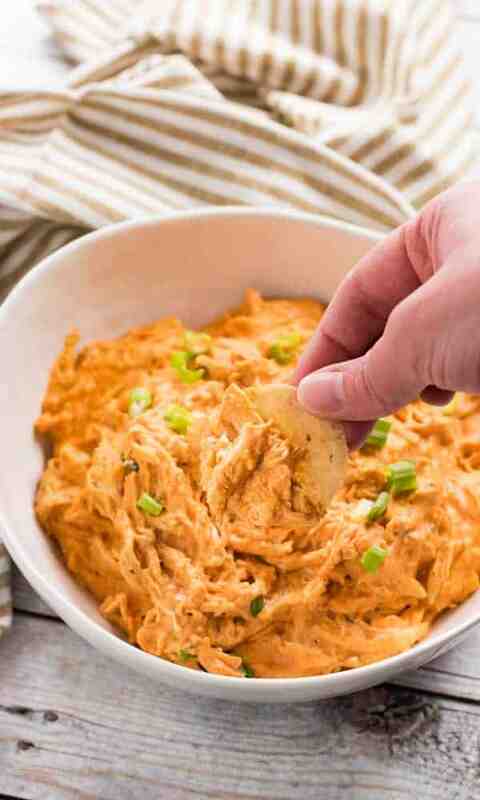 Can I Make Buffalo Chicken Dip Ahead? Yes, you sure can! Simply combine all ingredients as listed in the recipe card below. Then, pour into a container with a tight fitting lid, or a large zip-lock bag. 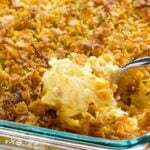 Refrigerate for up to 3 days before cooking and serving. 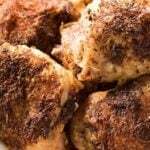 For this recipe, I like to use a rotisserie chicken when possible. 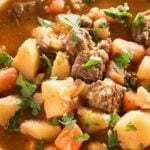 It is already cooked, easy to shred and get into the slow cooker quickly. You can also use canned chicken if that is your preference. 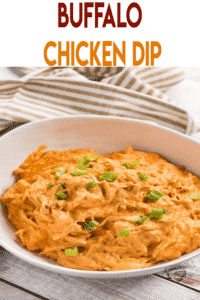 I am also fond of keeping this Crockpot Shredded Chicken on hand for dips like this! Soften your cream cheese and cut into cubes before mixing up your dip. Softened cream cheese is always the best option if possible. However, if you’re short on time simply cut the cream cheese into cubes first. This will ensure that it melts smoothly into the dip. Next, if making this in the crockpot you can simply combine all ingredients right in the slow cooker and mix to combine. Then, cook on low for 1-2 hours until hot and bubbly. Give it a good stir before serving to make sure everything is well combined. To make this in the oven. 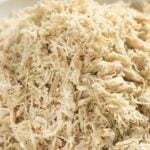 Combine the shredded chicken and remaining ingredients in a bowl and mix up with a large spoon. Bake in a 375 degree oven for 20-25 minutes. Be sure to follow along with us on Facebook where we always share the yummiest recipes! 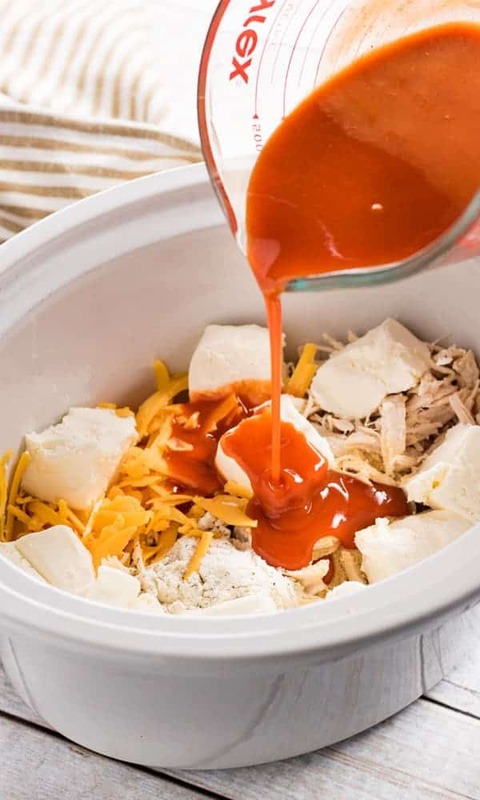 In a 2 quart or larger slow cooker add the shredded chicken, cream cheese, dry ranch mix, garlic powder, shredded cheese, and buffalo sauce. Cover the crockpot and cook on low for 1-2 hours until hot and bubbly. Serve dip with your favorite chips, crackers, and vegetables. 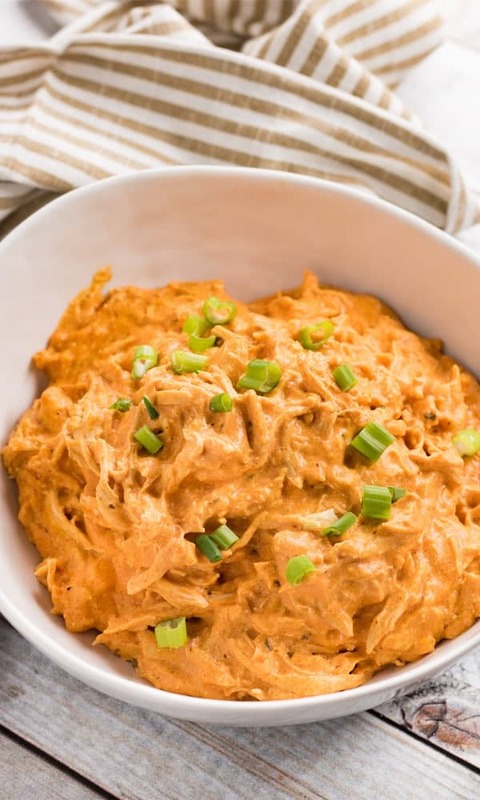 In a large bowl mix together the softened cream cheese, shredded chicken, ranch mix, garlic powder, shredded cheese, and buffalo sauce. Pour the dip into a 9x9 inch baking dish. Bake in preheated oven for 20-25 minutes, until hot and bubbly. How much time if baked in the oven? I’d say maybe about 20 minutes or so, just until it’s heated through. Which buffalo sauce do you recommend ? Franks? I’ve never made anything like this before. Tasted great and easy to make! The dip was AMAZING. I used canned chicken and was a little scared but it came out so nicely and creamy! 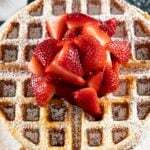 Super easy and overall amazing recipe! This Recipe came out great! So creamy and delicious. Yummy! And soooo easy to make. I served mine with celery, crackers and plain white rice. I saw a few people pile the dip ontop of the rice like a curry dish. I tried it, and it was also delicious that way! I’m concerned this won’t be creamy enough with just the packet of dry ranch. How did it turn out for you guys? Did you have to add mayo? It’s creamy because of the cream cheese. I’m sure you could add mayo if you’d like. Wow, did not expect the dip to be the best I’ve ever made. It really is the best recipe!! 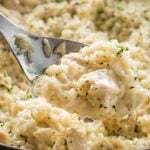 I learned that the creamy-ness depends on how finely you shred the chicken but even if you don’t shred it that fine this recipe still comes out really creamy! My husband make this all the time he usually add some Ranch or Blue cheese dressing to the mix. You can add Ranch dressing instead of the seasoning. One of my favorite things do with this dip Is it take jalapenos cut them in half take out the seeds stuff them with the dip then wrap them in bacon and put me oven or your air fryer until the bacon is crisp. That’s a good idea, I think I’ll try it for this year’s Christmas party. Ohh I’m so happy I found this recipe. I’ve been craving buffalo chicken lately and this is perfect! And I’m overstocked on chips anyway! Thanks so much for this recipe! I was in a hurry to figure out what to make for a party today. Googled at the grocery store. This came up. No leftovers! THANK YOU! Will make again and again! The vinegar in the hot sauce is plenty acidic for us. Super easy to make and double for a larger crowd. My husband said this was his favorite dip ever made. Will definitely be making it again! 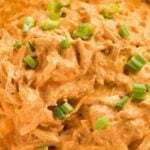 Buffalo chicken dip is a favorite of ours! I will have to give this dip a try. It sure looks simple and delicious! This dip will always have a special place in my heart and fridge! When I make this for tailgating it is always the first to disappear! This looks really good! Perfect appetizer for a crowd! That sounds so yummy, I’m ready for some right now! Love this dip! One of my all time favorites ?